As a logical follow-on to its successful initiative to pass a resolution designating May 19 as “Malcolm X Day” in the State of Illinois, the Council of Islamic Organizations of Greater Chicago (CIOGC) is supporting and mobilizing for the August 29 mass march for community control of the police. The march was initiated by the Chicago Alliance Against Racist and Political Repression (CAARPR) who have been fighting for a Civilian Police Accountability Council (CPAC) for many years. Now with the momentum built by CAARPR, Black Lives Matter Movement, We Change Genocide, Fearless Leading by the Youth (F.L.Y. ), and many other organizations – the demand for civilian control over the Chicago Police has grown into a mass movement of solidarity between community organizations in the city. 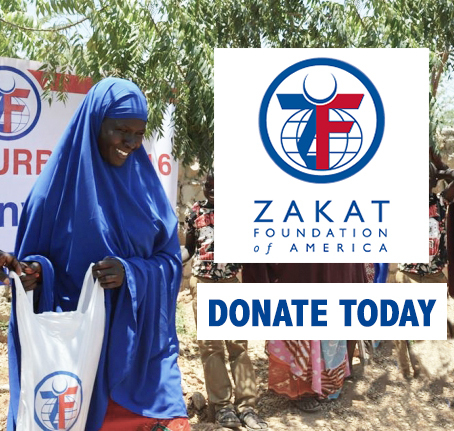 With the CIOGC being a federation of over 60 greater Chicagoland Islamic organizations representing over 400,000 Muslim Americans, the Chicago Muslim community is actively helping to mobilize for this march. Frank Chapman from the Chicago Alliance Against Racist and Political Repression (CAARPR) describes the campaign his group is leading for an elected Civilian Police Accountability Council (CPAC). This is not a “review” board, but an “accountability” council to be sure that victims of police crimes receive justice…It’s not only controlling how the police are policed, but also how our own communities are policed. Together with representatives from multiple community organizations, CAARPR has drafted a CPAC ordinance for the City Council that includes the responsibility for investigating all police shootings and allegations of police misconduct. The group is calling for a mass march to Chicago City Hall on August 29 to demand an all elected Civilian Police Accountability Council. The last planning meeting for the march had representatives from over 65 organizations including the CIOGC. The draft resolution for the Civilian Police Accountability Council (CPAC) has the following important components. Appoint the Superintendent of Police. Re-write the police rule book, including all use of force guidelines, Standard Operating Procedures, Rules, and General Orders. Investigate all police shootings, including all police involved shootings that kill unarmed people. Provide increased transparency of all investigations, including police involved shootings, and greater statistical analysis of demographic information of complaints by type and victim. Increase rates at which complaints are sustained based on thorough investigations of all allegations of police misconduct and violations of the U.S. Constitution and Human Rights’ law. Be the final authority regarding discipline in the Chicago Police Department. Indict police officers for crimes they commit. CPAC will take over the job of the Independent Police Review Authority (IPRA) and eliminate it. CPAC will reduce bias and guarantee fair treatment of victims of police misconduct. The primary goal of the CPAC resolution is to make a systematic change in how Chicago’s communities are policed. The Council, consisting of elected community members from all of the police districts, would be empowered to hold police accountable for the crimes they commit, and to control and decide how Chicago communities are policed. The resolution is a response to a history of unjustified police shootings; the torture of over 200 suspects under former Chicago Police Department (CPD) detective and commander Jon Burge, and the over 3,500 suspects, 82% of which are black, interrogated at the CPD’s Homan Square facility. In its statement of support for the march, the CIOGC explains further some of the reasons it is encouraging all Chicagoland area Muslims to participate. 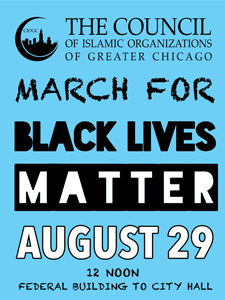 “CIOGC encourages the Muslim community join a mass protest on Saturday, August 29th, at 12 noon for a march from the Chicago’s Federal Building to City Hall to demand that the City Council enact legislation to create an elected, civilian police accountability council…This march coincides with the #BlackLivesMatter movement and the teachings of the Prophet Muhammad (peace be upon him) who used coalition building as a major strategy in his efforts for peace. Tabassum Haleem, Executive Director of the CIOGC, reminds those in the Chicago Muslim community that protecting the oppressed in society is a central component of Islam and a way to act in solidarity with all people of faith. The March for Community Control of the Police is a significant event in Chicago’s history. Multiple communities in the city, led by grass roots organizations and by youth of color, are demanding an end to police injustice by calling for the communities themselves to manage law enforcement. Stand in Solidarity. Civilian oversight for the Chicago Police. Is it too much to ask? Everyone is coming. Churches are coming, mosques are coming, temples are coming. Labor unions are coming. Are you coming? Once again, the March for Community Control of the Chicago Police will be on Saturday August 29 at 12:00PM. The march will start at Federal Plaza, Adams and Dearborn, and end at Chicago City Hall.